General Electric is getting rid of the light bulb, the most iconic product of GE's 125-year existence. Unveiling GE's roadmap, new CEO John Flannery said that the company would focus on its health, power and aviation businesses. Lighting didn't make the cut to be part of GE's future. The news itself isn't a shock: The company said in July that it was looking to sell its lighting business. Lighting is by far GE's smallest division, making up just under 2% of the company's overall revenue. And light bulb sales have fallen 66% so far this year. Still, a GE (GE) without light bulbs feels like an AT&T without telephone service, Campbell's without tomato soup or GM without Chevrolet. Light bulbs quickly took off after that, as did innovation that improved the invention. In 1892, GE began machine-molding bulbs instead of hand-blowing them. In 1906, GE engineer William Coolidge developed the modern light bulb with a long-lasting and super-bright tungsten filament -- an improvement that GE commercialized in 1911. By 1935, GE's light bulbs were bright enough to light the first ever Major League Baseball night game, played in Cincinnati. GE invented the fluorescent bulb in 1938, the halogen lamp in 1959 and the LED in 1962. 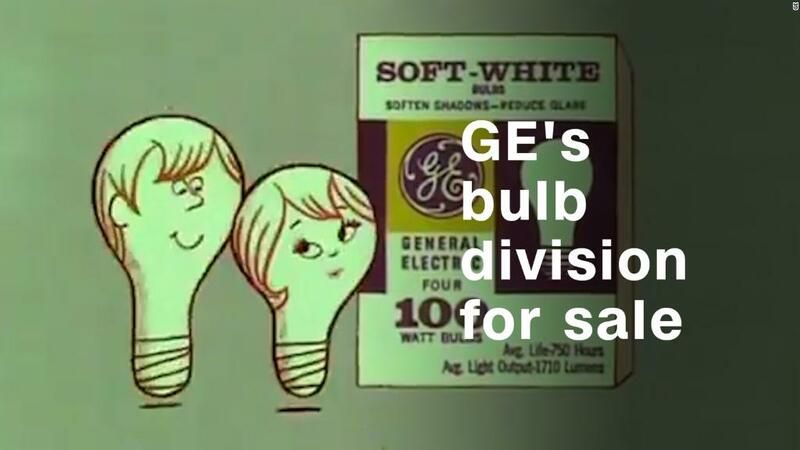 When GE ditches its lighting division, a move scheduled for next year or 2019, it will be the first time the light bulb hasn't been part of GE since the darn thing was invented. But there's a problem for light bulb makers like GE: LEDs last for decades. With no need to replace them, the bottom fell out of the market. Prices -- and revenue -- began to tumble.